Nebraska libraries have been keeping up with the trend to become the community’s technology center by providing public internet computers and free wireless internet access. Check out the charts below for an illustration of the upward trend among libraries that submitted their annual Public Libraries Survey. The actual figures of these two technology trends are 2,687 internet computers, or 1.85 for every 1,000 people served by a library. 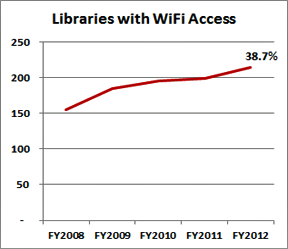 The number of public libraries now providing wireless internet connectivity has shot up to 215 or 80% of the state’s libraries. 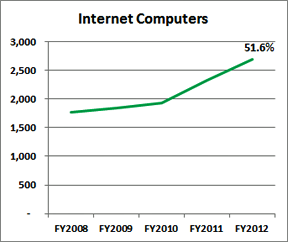 Source: Nebraska Public Libraries Survey, FY 2008 through FY 2012. This entry was posted in General, Library Management, Technology. Bookmark the permalink.